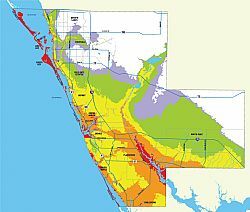 SARASOTA COUNTY – Important changes to Sarasota County's flood hazard maps are underway. Proposed floodplain boundaries, regulatory flood elevations and vertical datum changes have been received by your community officials and published in the Federal Registrar on Dec. 31, 2014. Proposed Draft FEMA Flood Insurance Rate Maps are scheduled for adoption in 2016. An interactive map, the Sarasota County Flood Zone Risk interactive mapping application, is now available at two locations on the Sarasota County website. The interactive map is located on the Flood Map Modernization page, which can be found here. Flood risks and flood zone maps can be found here. Fact sheets and other information including the upcoming Open House schedule is provided on the Flood Map Update home page. The map application allows all interested parties to search for county parcels by address and determine if the parcel is intersected by a preliminary FEMA designated Flood Zone. High risk is associated with the blue hatched areas and moderate risks, or "X Zones", are indicated by dotted gray areas. Other areas of low risk have no indicators. Both unincorporated and incorporated areas of Sarasota County are included in the interactive map, and a results window on the right side of the screen provides links for more flood information and to the Sarasota County Property Appraiser. For more information, call the Sarasota County Contact Center at 941-861-5000 or email: floodmapupdate@scgov.net.